New and comfortable apartment in a villa, on the 1st floor of a villa of one floor, in quiet and peaceful area, consisting of kitchen with beautiful panoramic views, furnished and equipped, with a sofa bed, full bathroom with shower, 1 bedroom with 2 single beds, double bedroom, 1 entrance, private terrace, panoramic and equipped with table, chairs and charcoal barbecue, laundry .The apartment has air conditioning, reserved parking, garden with swimming pool, swing, bedding , bathroom and kitchen, washing machine, iron and ironing board. far from the village of 800 meters from the sea and 1.2 KM. Close to the nature reserve of the gypsy, Bath of Segesta, Scopello San Vito lo Capo, Erice, Palermo. Site assistance h 24. Upon arrival, the owner or a local guide will accompany 'free Balestrate to let you know the streets, beaches, restaurants, pizzerias, shops you can servire.durante the months of July and August evenings in the square are particularly animated by songs, shows. we bought this house 'cause we were impressed by the convenient area, close to the village but not in the center, quiet, peaceful, with clean air and freedom' for our children to be able to play in the entire tranquility '.... The large garden has allowed us to be able to install a swimming pool and extensive property 'allows us to have a car parking space for us and for our guests .. THE GARDEN OF THIS PROPERTY 'AND ITS FRESH GREEN GRASS AND SENDING A SENSE OF CALM, PEACE AND THAT' OUTSIDE THE CHAOS AND DAILY ... '... RELAXING. REFRIGERATOR new capacity 'lt 200, with various compartments, fruit tray. with four burners, gas powered, electric ignition. 70 square meters of fresh green grass to lie down to sunbathe !! Awesome rental in Sicilian paradise! AWESOME! Casa Relax, Rosalia's rental was wonderful, and such a gracious host, including her family. We have traveled the world, the last 10 years, and this was the best rental we've ever stayed at. We're from Hawaii and Florida (US/United States), and know how tourists should be treated, and Rosalia was top-shelf! Our family of 3 (mom/dad, 1 daughter) recently spent 3 months in Casa Relax, and just loved it (mid-January to mid-April)! The 2-bedroom apartment, 1 bathroom, was tastefully furnished and decorated, with 2 balconies, and good Wi-Fi. The rooftop terrace is fabulous, with incredible views of the area, Balestrate, and Alcamo in the distance. For transport, Rosalia picked us up at the airport in Palermo, and took us back when we left. So convenient! Rosalia taught us cooking classes every week, Sicilian cooking, 1st course, 2nd course, and sweet, fabulous! Rosalia hosted us to many markets in the area, grocery stores, and to see local sites, such as Madonna del Ponte church. We were provided fresh fruit and vegetables from the property, and used many in the cooking classes we did. The house is located in a quiet location, but very close to town and the beach, which we went to daily. Great beach! Our apartment was very clean upon arrival, and had ample room for our family, given the large room sizes for us from the US/United States. Our hosts went to pizza with us to a GREAT restaurant, and also did a BBQ for our family with her family (including Grandma/Grandpa)! Extremely GREAT QUALITY for the price, and we would recommend to anyone to stay here, and we CAN'T WAIT to come back!!! Our family of 6 recently holidayed for two weeks in Casa Relax. The apartment fit the description in the advert and was comfortable and clean. There are two bedrooms with with a pull out bed in the living area. There are two balconies , one off the main bedroom and one off the kitchen with lovely views.Air conditioning is available if required. 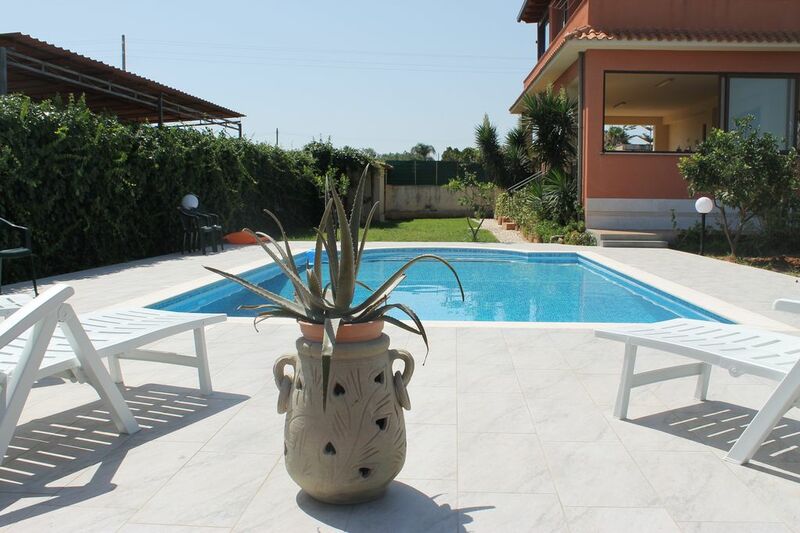 The apartment is located just outside the town in a peaceful rural area. We spent a lot of time on the large terrace, which was solely for our use, enjoying the beautiful Sicilian scenary, mountains and sea - absolutely fabulous. Signora Rosalia and her family were lovely and transported us to and from the airport as we chose not to drive. Rosalia also gave us a tour of the town and brought us to the supermarket to stock up on water and supplies and was very helpful. We were also treated to some of her own homegrown tomatoes. Overall I would recommend holidaying in Casa Relax. "Our stay was even better than we expected. The family was extremely helpful and friendly. The house was perfectly clean and we had lots of space. The house is located in a very calm place, so we had a good sleep! All in all it was perfect and we would love to come again." "Outstanding place with warm and friendly hosts." "Endroit tel que décrit. Très beau séjour avec accueil chaleureux et personnel. L’appartement est chauffé, au chaude, électricité, etc. Très calme, propre et bien équipé. Le contact avec la propriétaire fut très amical et agréable. As per description. Perfect stay with warm and personalized welcome. The apartment is heated, hot water, power, etc. Very quiet, clean and well equipped. Contact with owner was warm and friendly." Eine sehr saubere und praktisch eingerichtete Ferienwohnung mit großem Garten und Meerblick - zu Fuß war es zum Meer etwas weit, dafür ein sehr schöner Pool im Garten. Super-nette und entgegenkommende Vermieter, zuverlässig und hilfsbereit. Von Balestrate aus kann man wunderschöne Touren unternehmen, nach Segesta (Elymer, Tempel und Theater 2400 J. v. Chr. ), Erice, Castellammare del Golfo (unbedingt sehen! ), Scopello, Terrassini/ Bergwelt (Montanello), Salinen bei Trapani, Trapani... Dusty, der kleine süße Hund hat immer schon auf uns gewartet. Er lebt sozusagen auf dem Grundstück und passt auf. Preis-Leistungs-Verhältnis 100% gut! Wir würden wieder hinfahren! VOUS ATTEND CRYSTAL BEACH, plages dorées et un choix de restaurants où WIDE goûter aux délices de la cuisine sicilienne: JUICY PAR premiers plats SEA TO BONBONS GOURMANDISE 'A fromage typique !! supplemento di aria condizionata/riscaldamento di euro 5,00 al giorno. si consiglia di fare questa scelta al momento e sul posto in base al clima corrente.... dal 1° novembre al 15 aprile la piscina resta chiusa.